I recently finished painting my first model from the very popular Operation Red Veil, choosing to prioritise the redesigned Hsien Warrior because he’ll fit right into my existing imperial service. I already have a painted Hsien in the previous style (itself actually a redesign of a model that came and went before I took the Infinity plunge). The Hsien armed with a MULTI rifle served me well, but I always wanted to try the HMG yet never got around to buying one until now (To my surprise, a Hsien Warrior with a MULTI rifle in the new design is apparently not far off). The Imperial Service is certainly becoming the sectorial army of high fashion. I do love these coats. But it’s not just looks that kill. Ballistic skill 14 kills as well. Especially when it’s taking aim with a heavy machine gun through a Multispectral Visor Level 2 (2 is only one less than 3). Camo? Dead. Thermoptic Camo? Dead. Optical Disruption Devices? Dead. Smoke? Dead. The Hsien hits what he aims at unless it has white noise or eclipse grenades, and unless it is buried in armour and cover, there is a good chance what he hits becomes Swiss cheese. His combination of negative mod removing visor, high burst and high ballistic skill means he should win most exchanges in his active turn, and that’s how he should be used. He has some extras, some might call distractions, including a nanopulser, CC skill of 19, Martial Arts Level 1 and an APCCW. I think it adds flavor, and it is not without gameplay utility, despite increasing his cost without increasing the delivery of his core business. Some people will point out that for one point more, the PanOceanian Aquila Guard has BS 15 and MSV3, with the same armour and HMG. They are right that the Aquila Guard is some of the best value point and click in the game, but the Aquila Guard is not in a faction with 5 point smoke warbands. Many people have asked about which way the spines on the Hsien’s back should go. When the Hsien was designed, his antennae pointed up, and this can be seen on his dossier and on the renders released on Facebook by the sculptor, obscenely talented Javier G. Urena. When the studio put him together, they decided they liked how it looked down and rolled with that. This was not unanimous, but being 4 separate bits, it’s up to the owner to pick how they go. I like how they look angled down when looking at the back (my view from the table in-game), but I am not convinced I made the right choice when I look at him from the front. He would certainly have a more interesting silhouette if I went with up. Painting him was pretty straight forward, although I regret not doing the coat before the armour. Because I did the armour in my typical orange, which involves a red wash that has a tendency to overflow, I normally do it first. The large area of the coat however tempted me to use a larger brush which hit the armour in places. Nothing I couldn’t fix, bit I’ll know for next time. The coat was done in 3 layers. First was Vallejo Heavy Blackgreen plus GW Regal Blue. Second was Heavy Blackgreen plus Vallejo Turquoise. Final was Heavy Blackgreen plus Turquoise plus GW Bleached Bone. Be sure to check out the article written about my first Hsien if you haven’t already. It includes an allegedly useful guide for pronouncing “Hsien”. 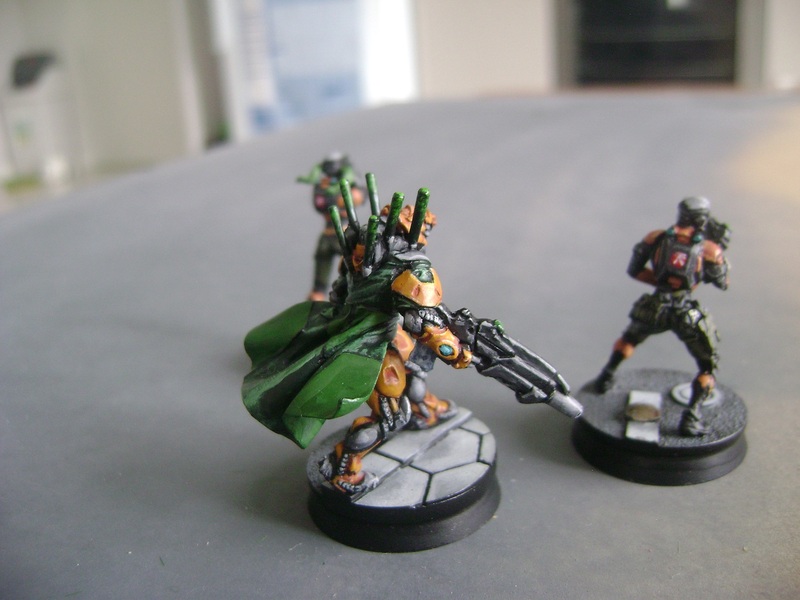 The first Infinity figure I ever bought and painted was an Imperial Agent Pheasant Rank. I didn’t realise it at the time, but this essentially meant I would never buy an Imperial Service Starter, as he is bundled into the kit. Not that it would have mattered to me in the slightest back then, because I never intended to play Imperial Service, much less use it exclusively. Funny how things work out, yet people still call slippery-slope a fallacy. I eventually grabbed a Celestial Guard hacker to enrol my remotes, but never really planned to take it further until I stumbled on an out of production Celestial Guard Kuang Shi Control Device blister that I could not resist, which also included one of the Combi rifle sculpts from the starter as well. So I grabbed a box of Kuang Shi to go with them, and went hunting for the out of production Celestial Guard MSR and Spitfire blister, as they were at that time already bundled with the Kuang Shi Control Device and Hacker I already had bought individually. I eventually found them, and got to thinking just how nice the 5 man fireteam bonus is, whilst at the same time trying to find the right way to exploit the smoke light grenade launcher wielded by the Celestial Guard with the Kuang Shi Control Device. I have a lot of Bao and a Rui Shi, so I am not exactly lacking Multispectral Visor Level 2, but I learned the hard way that these are not particularly durable troops, even when protected by Smoke. 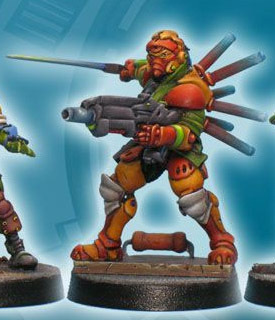 So the logical answer for how to get to a 5 man link of Celestial Guard were the Combi rifle and Boarding shotgun sculpts exclusive to the starter, and with them the Hsien, a super elite heavy infantry trooper with an MSV2, also bundled into the starter. 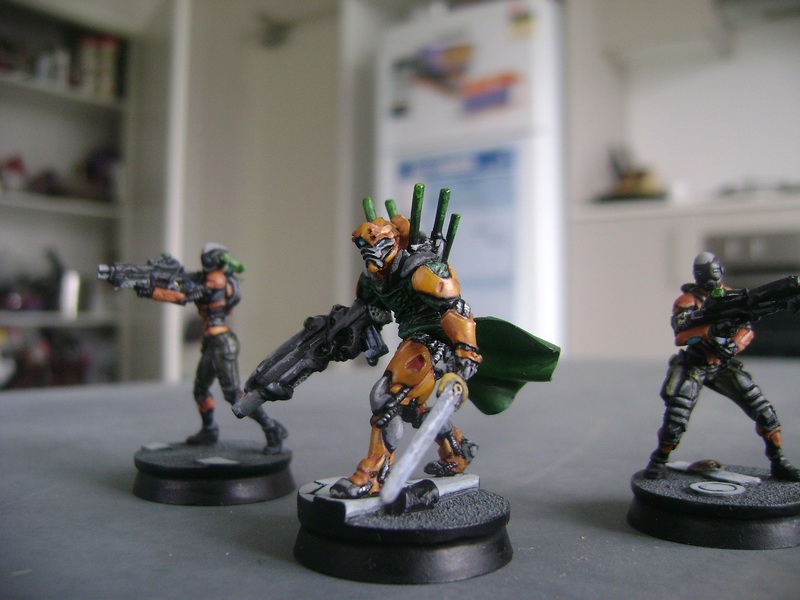 By then I had also impulse bought a Wu Ming fireteam, including the separate boarding shotgun blister, which is, you guessed it, also bundled into the starter. It was beginning to look like I had made some poor economic decisions. Thankfully this story has a happy ending, as a player on the Infinity Australia Facebook page was selling piecemeal some of his less used figures, mostly assembled and primed. I jumped at the opportunity and, as you can see, finally got what I needed. There is a lesson here. I now have every model in the starter, and every model in the Celestial Guard support pack, only I bought them individually at a greater cost than the two bundles. I really should have just started with the starter. 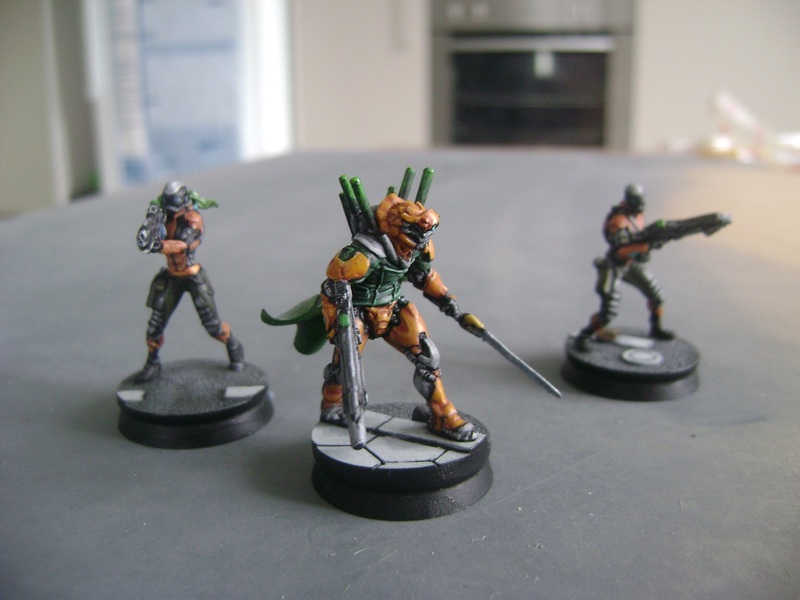 The second-hand figures came fixed to Micro Art Studio Urban Bases. I originally planned to re-base them with my usual bland basing style to make them fit in with the rest of my guys, but once I had them in my hand and saw what a nice job the seller had done with them, I pulled a 180. I really like the sculpt, he has a posture that is both menacing and commanding. Also his head looks a lot like that of EVA Unit 02, which I don’t think is an accident. To paint his armour, I used the usual orange. It was a welcome break from the earthier tone I use for most other Imperial Service units like the two Celestial Guards in the background of these photos. His cloak is a mix of Games Workshop Dark Angels Green and Regal Blue for the base layer, with successively more Bleached bone added in layers that covered successively less of it.The padding on the inside and outside of his cloak was painted with Vallejo Mutation Green, with I think Games Workshop Dark Angels Green watered down over it, I kinda rushed that bit. Hsien is the Wade-Giles romanisation of the character ‘仙’, which is romanised as ‘xiān’ using the more modern and intuitive pinyin system and means Immortal. Xiān/仙 can be pronounced by taking the ‘sh‘ from ‘shot’, and placing it before ‘yen’ like the Japanese currency, and saying it all as one syllable. This is the exact same xiān that is used as the first character of crane. 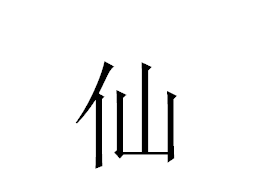 As I mentioned in that post, the character means ‘immortal’ and interestingly, is made up of the character for ‘person’ (人) and ‘mountain’ (山). The implication here is one of transcendence, becoming immortal by ascending the mountain. I don’t quite get it, but as I pointed out in that earlier post, the relationship between immortals and mountains is hardly unique to China. Unexpectedly, the Xiān/仙 character does not feature at all in unit insignia of Hsien Troops. In addition to the characters 龙服务/lóng fú wù/Dragon Service running across the top, which is the in-universe name for the Imperial Service, the insignia instead features the character ‘永/Yǒng’ prominently. 永/Yǒng means perpetual/eternal etc, similar to what Xiān/仙 means. I’m unsure why they elected not to use 仙 in the logo or call them Yong Troops. 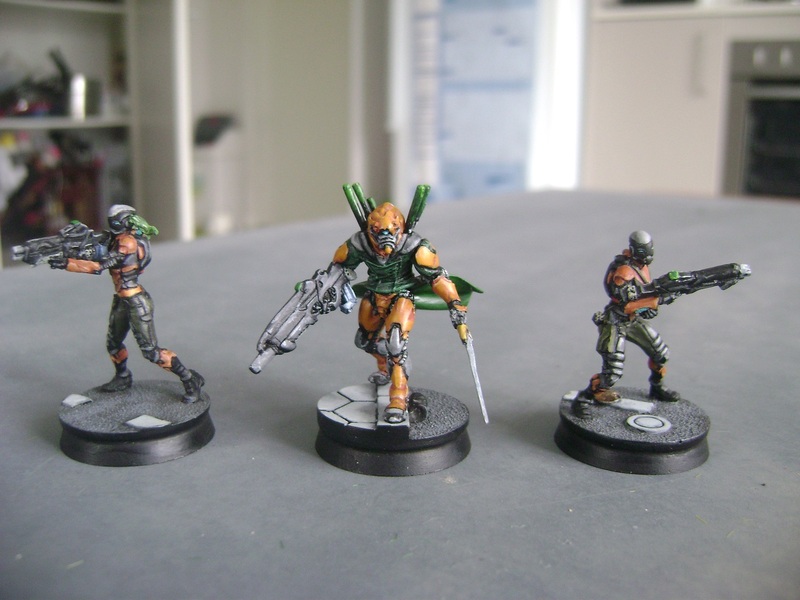 That said, Hsien have been part of Yu Jing from the beginning and Corvus Belli’s use of Chinese has definitely improved greatly with time, so it might just be a legacy thing.